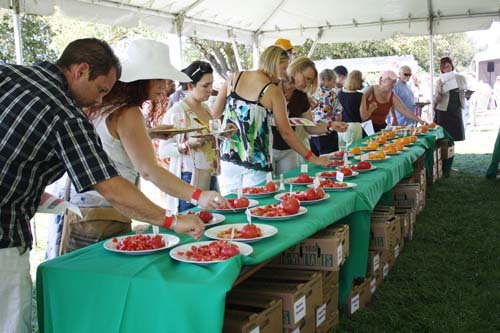 The Kendall-Jackson Heirloom Tomato Festival sells out every year, and this year was no exception. 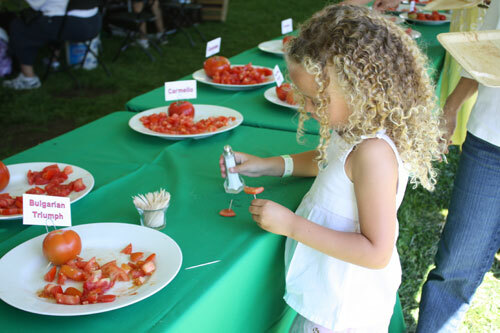 Over 3,000 tomato fans turned out this past Saturday to enjoy a hot summer day on Kendall-Jackson’s beautiful grounds, from which more than 175 varieties of heirloom tomatoes were picked fresh for the festival feasting. 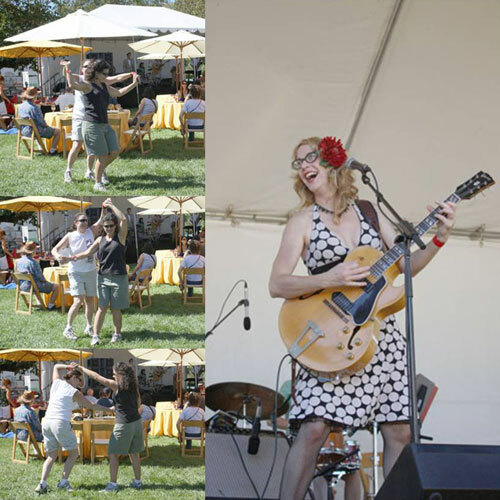 The day-long event featured live music, wine and food education seminars, cooking demos, a Chef Challenge, wine tastings, and tasting tables from more than 50 local restaurants, all featuring -- you guessed it -- juicy, sweet, heirloom tomatoes. A majority of the dishes featured some combination of tomato + carb + cheese (no complaints here). 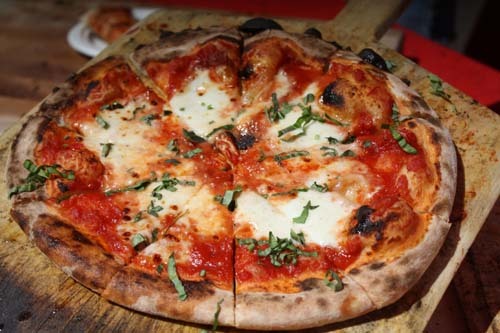 Jackson's Bar and Oven had their wood-burning oven set up right on the patio, churning out saucy Margherita Pizzas as guests came filing in. 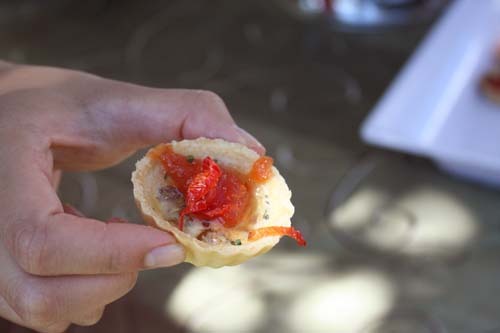 I was excited to see The Girl & The Fig representing with a savory Gruyere & Bacon Tart, topped with Early Girl Tomato Marmalade and House-made Sundried Tomato. Veering towards the sweeter spectrum was an interesting creation by Executive Chef Thomas Schmidt of John Ash & Co. at Vintners Inn. 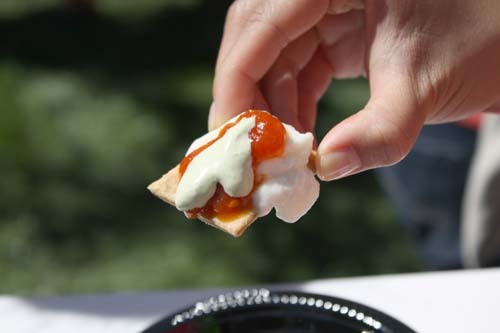 Schmidt served up Tomato "S'Mores" made with House-made Herb Crackers, Burrata Cheese, Tomato Jam and Basil-infused Kendall Farms Crème Fraiche. 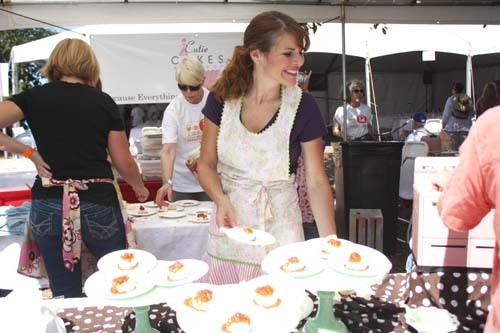 I loved the creativity here, and it was just the right warm-up as we headed next to the tomato-inspired desserts! There were Mini Heirloom Tomato Waffles with Whipped Tomato Butter & Heirloom Syrup from Nectar, Fiorello's Watermelon Tomato Mint Gelato from Gotta Havit Desserts, and my favorite, a buttery, burnt caramel confection from Cutie Cakes Bakeshop -- Sticky Fingers: Vanilla Butter Cake with Pineapple & Cardamom-scented Caramel and Brown Sugar Heirloom Tomatoes. And if it was straight up, unadulterated tomatoes you were looking for, all you had to do was head to the Tomato Tasting Tent where there were a dizzying 192 different varieties of heirloom tomatoes to try. You've probably heard of red, green, and yellow tomatoes before, but did you know there are also varieties that are categorized as white, gold, orange, pink, purple, brown, and even black? 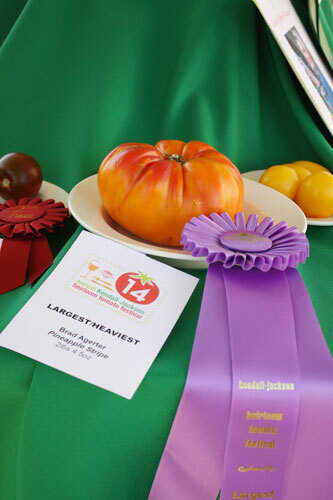 The experts also weighed in on their favorite home-grown heirlooms. In the Largest/Heaviest category was a Pineapple Stripe, grown by Brad Agerter, weighing in at 2 lbs 4.5 oz. 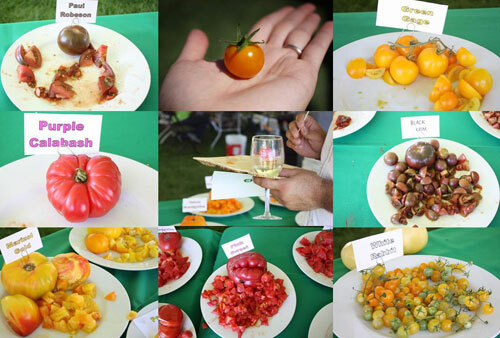 Best of Show in the Festival Growers Competition went to Mia Brown's Green Doctor cherry tomatoes. What started as an innocent hobby with 15 or so plants, has expanded over the years to 171 plants and over 85 varieties. Mia lives and grows her tomatoes in Lodi. When she's not growing heirloom tomatoes, she's a practicing attorney with a focus in water rights, agriculture, and public agency law. 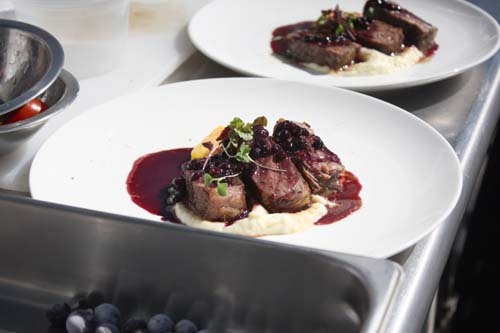 The event culminated in a head-to-head throwdown between Chef Challenge finalists, Justin Wangler (Kendall-Jackson Wine Estates) and Ryan Scott (Ryan Scott 2 Go). 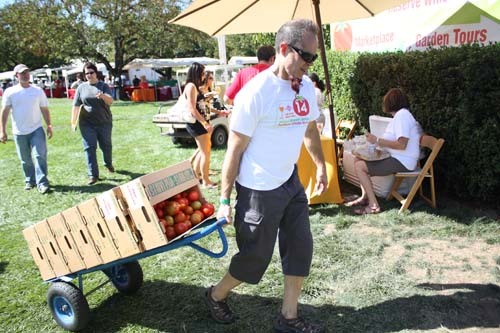 The Kendall Jackson Heirloom Tomato Festival contributes all its net proceeds to the School Garden Network of Sonoma County, an organization that helps students develop dedication to the environment, academic achievement and their communities, with hands-on learning about food and nutrition.